Cotton University Recruitment 2018 | Store Officer, Assistant Librarian, Administrative Officer, JE, Junior Assistant Posts :- Hello everyone. Cotton University which is Assam’s one of the Top Universities has published a recruitment notification for various vacancies. According to the latest Cotton University Recruitment 2018 , Applications are invited for the following posts from candidates who are Indian nationals and are committed to establishing a University of excellence, proud of working beyond the call of duty and upholding the highest Standards of ethics and public accountability for the recruitment of Non-Teaching Positions in Cotton University. We shall discuss more about this recruitment in below section.Let’s check it out. In this section, we will discuss in detail about Recruitment of various posts under Cotton University Recruitment 2018 (August) with all the details and requirement. No of posts: 1 [UR: 1] Educational Qualification: A post-graduate degree from one recognised University with at least 50% marks or its equivalent in the CGPA scale; service experience for at least seven years in the line of general administration, out of which 5 years must be in a responsible post in the rank of Superintendent or equivalent or still higher post in government/semi-government recognised public institutions/ undertakings,functional computer literacy. No of posts: 1 [UR: 1] Educational Qualification: A postgraduate in Library Science/Information Science/Documentation Science from a recognised University with at least 50% marks or its equivalent in the CGPA Scale. Qualifying in the national level Test (NET) conducted by UGC or any other approved by UGC. No of posts: 1 [UR: 1] Educational Qualification: A post-graduate post graduate in commerce from a recognised University with at least 50% marks or its equivalent in the CGPA Scale; service experience for at least two years in the line of finance and accounts in a responsible post in the GP of Rs 4200/-(pre-revised) and above or equivalent or still higher post in the government/ semi-government or recognised public Institutions/ undertakings with functional computer literacy and financial package. No of posts: 1 [UR: 1] Educational Qualification: A B.E /B.Tech or its equivalent Degree/Diploma from a recognised university / institute with atleast 50% marks or its equivalent in the CGPA Scale, functional Computer literacy. No of posts: 2 [UR: 1, OBC: 1] Educational Qualification: A graduate degree from any recognized institute with 50% or its equivalent in the CGPA Scale, functional computer literacy. 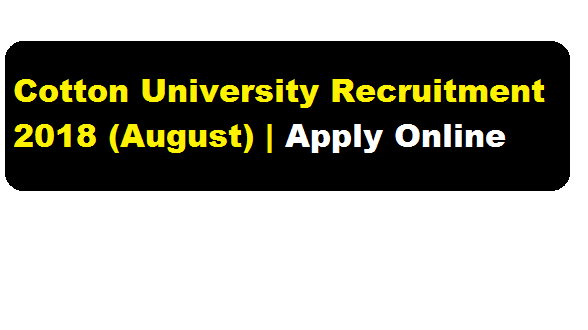 Interested candidates fulfilling the eligibility criteria need to apply online by visiting cotton university website by August 27th 2018.